Star Wars Easter eggs are just about the most highly-guarded secrets in the galaxy. The top-secret Solo: A Star Wars Story cameo was one such thing. It was so hush-hush, in fact, that even the person filming the cameo didn’t even know if they’d be in the final cut, such was the secrecy behind everything involved. Spoilers for Solo: A Star Wars Story are down below so, if you haven’t seen the movie, you might want to take five – unless you want to join the Dark Side, that is. “I’ve been working on this for three years to get you back,” Ray Park reveals when speaking to /Film about Solo: A Star Wars Story writer Lawrence Kasdan’s decision to get the (again: spoiler) Darth Maul cameo ball rolling. But even then, there were a fair few Jedi mind tricks involved as the team wanted to keep the identity of the Crimson Dawn leader under wraps. The eventual cameo, which saw Emilia Clarke’s Qi’ra take the reins, betray Han, and forge her own villainous path before contacting Darth Maul, was a surprise to many, including Ray Park himself, despite the character’s resurrection away from the main series of movies. 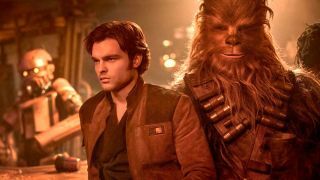 Credit, then, has to go to everyone in the mix for making sure the Solo: A Star Wars Story cameo didn’t leak out – even if it meant screwing with Ray Park for a bit. The Darth Maul reveal was a capper on a pretty decent movie, and it’s definitely opened up things for a potentially very exciting sequel. Eager to see what happens next? Here's what that shocking Darth Maul cameo might mean for future Star Wars sequels.